St. Margaret's originally started out as a weekly service in the one of the local elementary schools' gymnasium. Since that time, in the last ten years, it has grown; having moved from the gym, to the Letitia plaza storefront, to a portable at its current location, to its existing partially completed permanent location, which was officially dedicated in April of 1999. Within the next few years or sooner, it is hoped that we will be able to expand our facilities to better serve the needs of the church and the community. 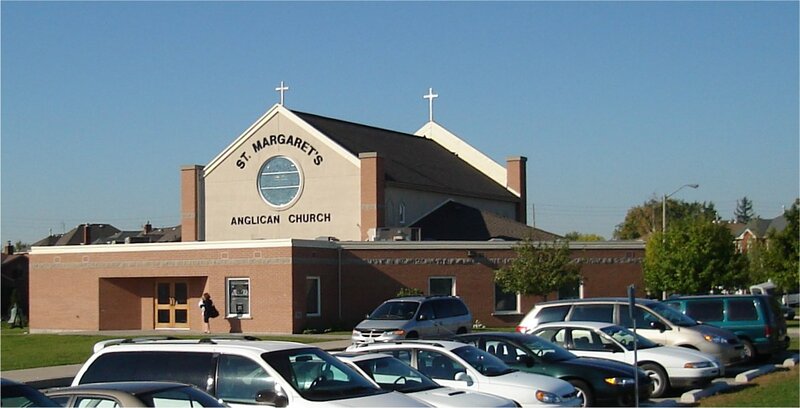 St Margaret of Scotland Anglican Church was founded in the mid 1980's, beginning as a gathering at the local community hall, then moving to the Letitia Heights plaza. In 1995 the church moved to its present location near West Bayfield School. The permanent facility, a 3 phase ongoing project began with a portable unit. Since that time the first phase of the permanent building was opened in April of 1999. The final stage of construction is expected to take place within the next five years, to include a nursery and sunday school facilities as well as a banquet / meeting hall. Our parish logo symbolizes St Margaret, who gathered the orphans, the poor and the sick to herself. Margaret became Queen of Scotland in the year 1070, when she married King Malcolm of MacBeth fame. She opened her arms to the people. Orphans were taken into the royal palace, the sick and the suffering tended, prisoners of war released and the poor were fed. Through devotion and love, Margaret won the hearts of the Clan Chieftains and aided Malcolm in uniting Scotland as a nation. She died in 1093 and was made a Saint in 1251.